The stadium that was originally named Carolinas Stadium, then Ericcson Stadium now features Bank of America as the owner of its namesake and is the homefield for the Carolina Panthers. Many other sites in Charlotte were considered for the location of the site, before eventually deciding on Charlotte Center City. The stadium has a very unique and distinguished design to it. The three large main entrances, the arches that support the upper deck towering overhead, and several acres of trees surround the venue. Due to its geographical location and open-air facility, the stadium has been the site of a number of some extreme weather games, particularly with heavy downpours. On December 5, 2015 the stadium set its personal record attendance with 74,514 fans featuring a college match up between the Clemson Tigers and the North Carolina Tar Heels. The Tigers won the game by a score of 45-37. The game is regularly referred to as an instant classic. After being named Ericcson Stadium since 1996, the naming rights were then bought by Bank of America in 2004 as apart of a 20 year contract. 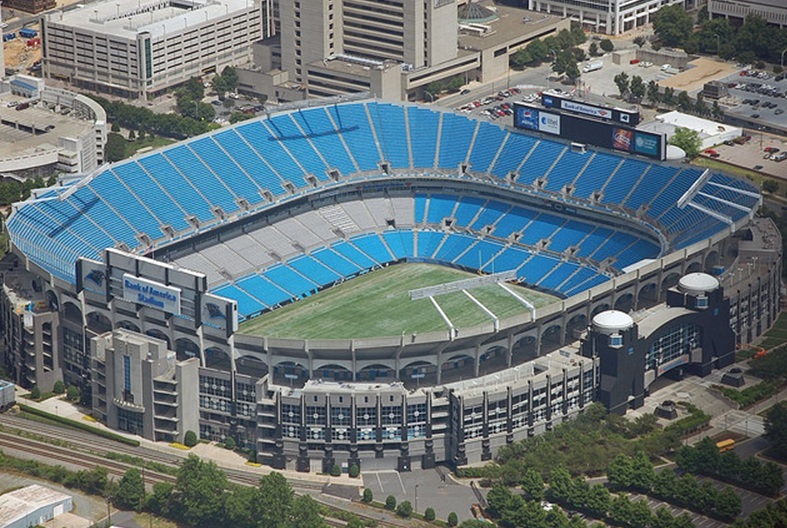 The stadium fits 75,412 fans and is located in Charlotte, North Carolina. • The Panthers played their first season in Carolina at Clemson University Memorial Stadium until the completion of their own stadium. • The stadium has been the site of seven NFL playoff games since its creation, and the Panthers have sold out every home game at the facility since 2002. • Upon its creation, the stadium was considered so ahead of its time that even in 2013, it only needed very minor renovations to update it and is still considered among the best stadiums in the league. • On their way to the NFC Championship Game in 1996, the Panthers beat the defending Champion Dallas Cowboys in their first home Playoff game at Bank of America Stadium. • In 2014 the stadium underwent a few more intensive renovations, among the major changes were the addition of two 200ft x 56ft HD video screens, and two 360 degree ribbon boards to replace the old scoreboard. • In 2015, the stadium again made a few minor renovations mostly focused on the luxury suites on the midlevels of the stadium. • The stadium is the home of college football’s Belk Bowl since 2002 and the ACC Championship Game since 2010.